Dust Suppression for Village of Dunnottar - Cypher Environmental Ltd. The Village of Dunnottar is a community on the shores of Lake Winnipeg. We strive to be aware of the products we use within our community as they will have an effect on the health of Lake Winnipeg. Dust suppressants have been a big concern of mine because they generally have a toxic chemical base (art.64 CEPA). We became aware of Cypher Environmental and their Dust Stop product. Dust Stop contains 100% organic materials that are completely biodegradable, non-toxic and non-hazardous. 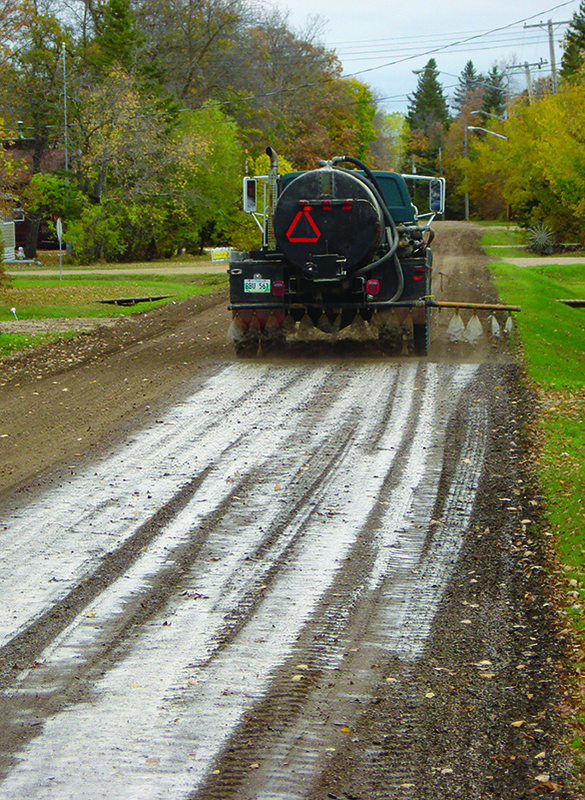 This past summer the Village applied Dust Stop product to our roads with very satisfactory results. Even with an extremely wet summer, we were pleased with the performance of this product. We are definitely planning to use Dust Stop again next season. I recently attended the Association of Manitoba Municipalities Convention and Trade Show. The Cypher Environmental booth seemed to be one of the most popular booths there which indicates other municipalities are coming to the realization that we need to be more aware of the products we use and their environmental consequences.